Eight Dates (2019) helps couples navigate the ups and downs of a relationship. Whether you’ve been married for years or have just met the love of your life, the bedrock of any relationship is quality conversation. 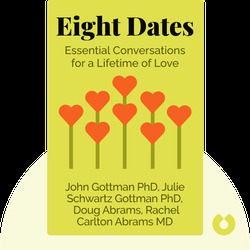 Uncover your partner’s innermost needs and desires by going out on the eight themed dates set out by the authors in this book. But don’t stop there – the wisdom from these eight recommended dates can be applied to any date you and your partner go on. Dr. John M. Gottman, PhD, is an American psychological researcher, clinician and award-winning speaker. He has over four decades of experience researching divorce prediction and marital stability. John is married to Dr. Julie Schwartz Gottman, PhD, a clinical psychologist, speaker and author. 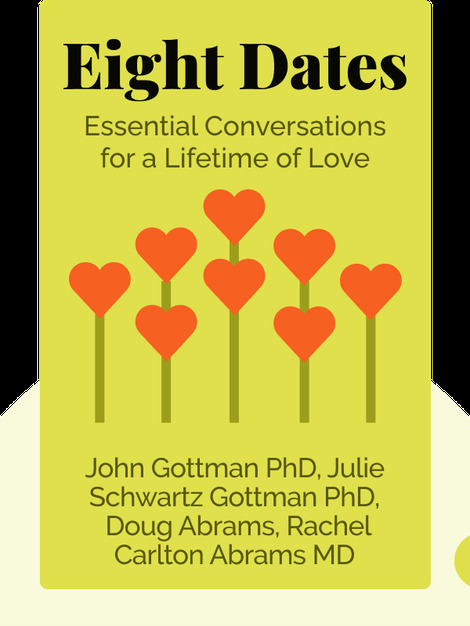 Together, they founded the Gottman Institute, a center that provides couples with research-based tools to strengthen relationships. They’ve also published multiple books on love, romance and relationships, such as The Man's Guide to Women: Scientifically Proven Secrets from the "Love Lab" About What Women Really Want and The Science of Couples and Family Therapy: Behind the Scenes at the "Love Lab." Dr. Rachel Carlton Abrams, MD, is an integrative physician and the author of BodyWise: Discovering Your Body's Intelligence for Lifelong Health and Healing. Her husband, Doug Abrams, is the president and founder of Idea Architects, a literary agency. He is also the author of the best seller The Book of Joy, co-authored with the Dalai Lama and Desmond Tutu.